The Community Emergency Response Team (CERT) Program educates people about disaster preparedness for hazards that may impact their area and trains them in basic disaster response skills, such as fire safety, light search and rescue, terrorism awareness, team organization, and disaster medical operations. 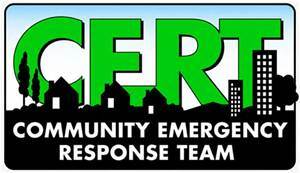 CERT Teams are organized at the local level, typically by a responder agency. Using the training learned in the classroom and during exercises, CERT members can assist others in their neighborhood or workplace following an event when professional responders are not immediately available to help. Individuals interested in the program generally start with Basic CERT training. Many of the Basic CERT Training participants attend only to obtain the knowledge and skills provided throughout the initial training, others choose to participate as an active member of their local team. Active CERT members have taken the Basic Training and can be called upon by their sponsoring agency during a disaster or other emergency to assist in critical response roles. These roles may include local Emergency Operations Center (EOC) staffing, emergency shelter operations, disaster assessment, first responder support, assisting with decontamination or HAZMAT operations, or other critical tasks that require additional volunteer manpower. Franklin County supports the CERT program through coordination with the Pennsylvania Emergency Management Agency by obtaining available supplies and training materials. The county will also support the local programs by assisting with training coordination and exercise and facility scheduling. Any CERT integration into the County Emergency Operations Plan or Emergency Operations Center will be coordinated at the county level. If you have questions concerning the CERT program, contact the Operations and Training Officer at 717-264-2813.